What’s too tacky amid a hurricane threat? Fundraising? Trump attacking Gillum? There's a ritual candidates and campaigns go through on those all-too-frequent occasions when Florida faces a hurricane threat and after a storm hits. THIS IS NO TIME FOR POLITICS, they declare, when in fact almost nothing that happens in the final months of an election is free of politics. Rick Scott has an excellent chance of beating Sen. Bill Nelson because his handling of Hurricanes Irma and Maria made him more popular than he ever had been as governor. Cynical as it sounds, every televised update and briefing Scott gives Floridians this week is effectively a top notch campaign ad and bad news for Nelson. Expect Florida's Senior Senator to find a few TV cameras this week — for purely apolitical purposes, of course. Ron DeSantis' campaign handing out emergency supplies is a nice, helpful gesture. Also a political one. Same with Tallahassee Mayor Andrew Gillum's decision to suspend his campaign — and have his city manager send political reporters a detailed run-down of Gillum's storm-preparations Monday. And same with Florida Democratic Party Chairwoman urging Gov. Scott to extend the deadline past Tuesday for registering to vote for the election: "The impending hurricane will adversely impact the ability of eligible, but unregistered, individuals who may have waited until the last day to register to vote," she wrote. "These individuals may forego registering, in view of your warnings regarding the danger of the storm, the need to prepare, and anticipated and existing evacuation orders." Inevitably there are clumsy failures in maintaining the charade that campaigns have stopped thinking about politics. The Florida Democratic Party on Monday sent a tracker to videotape Gov. Scott talking with local officials in Pasco County about Hurricane Michael. Tsk. 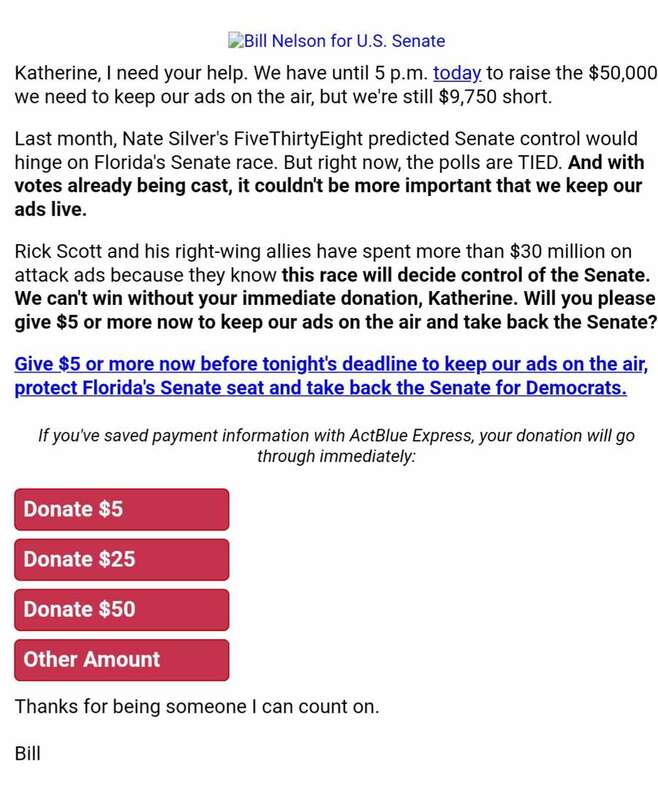 We saw multiple fundraising emails from the Gillum and Nelson campaigns today. Tsk, tsk. And Donald Trump didn't even pretend politics are off-limits in an interview with WFTV in Orlando today, following his ostensibly non-political speech to police chiefs. "(Gillum) runs an area and a city that's got among the worst statistics in the country and certainly in the state," Trump said, referring apparently to crime. "If his (DeSantis') opponent gets elected, you'll have Venezuela — Florida will become another Venezuela, and that is not good." Gillum tsk, tsked on twitter. Hey @realDonaldTrump — don't come to my state and talk trash about my city while we are preparing for a Category 3 hurricane. We need a partner right now, not a partisan.